January 22, 2013 (San Diego’s East County) – Leash Your Fitness, announces a six-week series of fitness challenges to help you get in shape after the holidays—while getting a workout for your dog, too. “Our first three challenges were very successful for all of the participants,” said founder Dawn Celapino, whose motto is “Life is short! Exercise with your dog.” The kick-off to the Fitness Challenge will be held at Marking Pet Resort on Sunday, January 27 from 11 a.m. to 1 p.m. The program runs for 6 weeks and is an online program open to anyone who wants to participate. 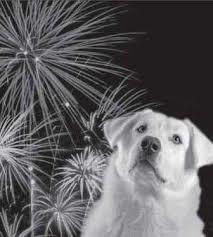 July 2, 2012 (San Diego’s East County)--Do you know that the Fourth of July is the busiest day at most animal shelters? Dogs have highly sensitive hearing and can detect sounds high above human capabilities. Their ears are mobile due to 18 muscles that turn, lift, and tilt them to pinpoint where the sound is coming from. Because of their acute sense of hearing, dogs can hear sounds from four times the distance a human can. April 11, 2012 (San Diego)--Do you run with your dog? How about kayak or surf? I know that you don’t leave Fido at home while you are out having fun! There is no reason not to include Fido into most of your outdoor exercise routines. Exercising with your dog is not only fun but it creates a great bonding experience! February 25, 2012 (San Diego’s East County)--Has your dog ever been in the snow? Most active dogs love it! They are like kids, romping and running in the fresh powder. There are, however, a few things that you need to know if you plan on taking Fido on a snow vacation, especially if they are not used to the cold. THE DOG BLOG: LOST OR FOUND DOG? WHAT DO YOU DO? November 29, 2011 (San Diego’s East County)--Have you ever experienced any doggy parent’s worst nightmare--losing your dog? Have you ever found a dog and didn't know what to do? Read more about THE DOG BLOG: LOST OR FOUND DOG? WHAT DO YOU DO? November 12, 2011 (San Diego) -- You see it all of the time at a very busy dog event, farmers market, or walking event; people are using retractable leashes on their dog. The person’s dog is roaming all over the place, the leash is at full length, and it trips somebody or worst cuts their leg. Retractable leashes are dangerous and should never be used at a busy event. If the dog starts running and somebody grabs the leash, a dangerous cut or worse a finger amputation could happen and it has, many times. October 30, 2010 (San Diego) -- Most dogs don't care if it is raining, but some do. Most people do care if it’s, raining but some don't! Exercising in the rain can be fun and can feel good-- but there are some things you may want to do to make your session safe and enjoyable for you and your dog. THE DOG BLOG: 5 TIPS FOR WORKING OUT WITH YOUR DOG! January 19, 2009 (San Diego’s East County -- It is New Years Resolution time and although, taking rover for a walk is GREAT exercise—most people need a little more. The following are five tips that you can do with your dog to prevent boredom, burn more calories, and gain more strength. Read more about THE DOG BLOG: 5 TIPS FOR WORKING OUT WITH YOUR DOG!